From the very first glance you can tell that the 7 x 7 Shire Barn Double Door Shed is not like all the other discount sheds. This one has a charm and style that is all its own which really sets it apart from all the rest. 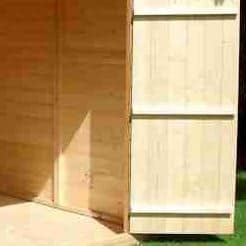 The very good looks of this shed mean it will stand in your garden with pride. 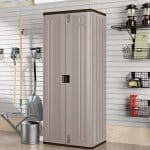 Also while it offers 7 X 7 of storage space it does not require a huge garden to be installed in. The shed has a fantastic set of large double doors that are nearly 5 feet wide! Plus there is a very smart looking glass window on the side that actually opens. Perfect if you are pottering around in here on a hot day. 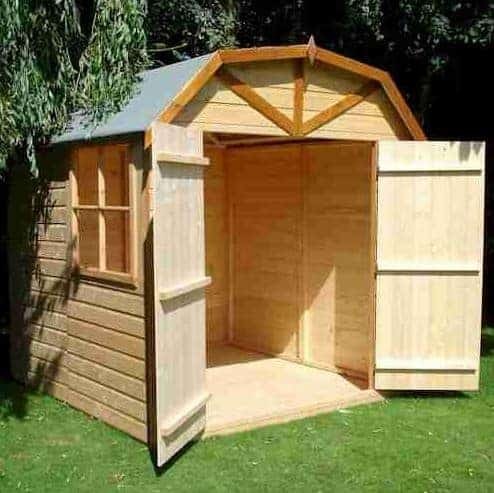 While this is a shed that is very easy on the eyes, it is also one of the more robust discount sheds we have seen. Smooth tongue and groove cladding and a frame that is 34 mm x 34 mm make for one very solid team that is going to really make sure this shed lasts a lifetime. The floor is just as strong as it is also made with tongue and groove boarding which as well being able to take a lot of weight goes very well with the overall design. The 7 x 7 Shire Barn Double Door Shed is one of the more expensive discount sheds that we are going to review, but when you see just how much this offers, you will see why even at just over £400, we have put it in this section. The depth is 6 feet 9 inches and the width is 6 feet 8 so you have a bit more space than you get with most sheds in this category. We feel that this kind of space and its rather box shape will make organising your belongings very easy. Due to the Dutch barn design, you have a generous amount of headroom with the peak being 7 feet 4. You will find walking around inside of here very comfortable and we are sure you will spend many hours pottering around. The roof is really cool and is very different to what we have seen on other discount sheds. The Dutch barn design gives you a roof that is all its own style. It is made with solid sheet boarding and covered with roofing felt, but because of the extra framing this roof has it is very, very strong. The roof has a very smart overhang and on the front of the shed there is this lovely design that just finishes off the whole front of the shed perfectly. The cladding they have used on the 7 x 7 Shire Barn Double Door Shed is fantastic. The tongue and groove shiplap cladding that makes up the walls has a very smooth and classy kind of look to it. We love this design, but the cladding is not just there for eye candy. It is also thick and solid. Plus this kind of cladding interlock so tightly that it is pretty much impossible for water to get inside the shed. The frame being 34 mm x 34 mm is what took us by surprise the most. The frame is very solid and as well as being practical. On the inside of the shed it is a pretty good feature from a design point of view. It is nice and thick and really does help give the shed the Dutch barn look they were going for. At 34 mm x 34 mm this frame is much thicker than what you usually get when dealing with discount sheds. When we first started looking at the 7 x 7 Shire Barn Double Door Shed we were sure it would use solid sheet boarding for the floor, just like the roof, but they have gone that extra mile and used tongue and groove flooring. This kind of flooring offers you more strength than standard solid sheet boarding, but it also looks fantastic and goes very well with the wall cladding. All of the wood has been dip treated so while the shed is being delivered and while you are installing it, it will be fine. But as it would be such a shame for that gorgeous cladding to develop rot, you will need to give it a coating of wood treatment shortly after you have installed it. Now most retailers will say within a couple of weeks, but we always feel that sooner is better. The shed will require a fresh coating on a yearly basis, but if you do this then that smooth cladding will stay that way forever. 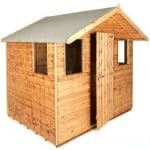 The 7 x 7 Shire Barn Double Door Shed comes with a one year warranty which if we are honest is very short. 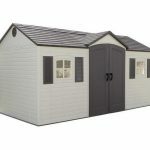 Most of the other discount sheds we have looked at have a 10 or 15 year warranty. A huge part of the Dutch barn design is those large double doors. With both doors open you have an incredible 4 feet 6 inches of width. 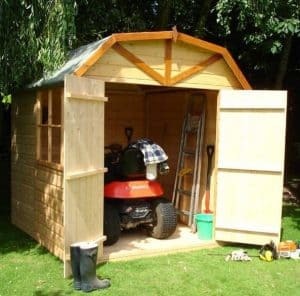 We have seen sheds that have double doors which only offer about half of this! In addition to this there is 5 feet 6 inches of height as well so getting in and out is going to be incredibly easy, even if you are trying to carry about five different power tools. The doors are also very well made, supported with strong framing and attached via some impressive door hinges. One window is on the side of the shed, but this window is made from glass and it can also be opened. We really cannot stress enough how rare this is for a discount shed to not just have a glass window, but also one that opens. As you will be spending quite a bit of time in here, we think you will be thankful that you have the option to crack open a window and let in some fresh air. To keep the glorious doors of the 7 x 7 Shire Barn Double Door Shed securely closed a pad bolt is included. We always like a pad bolt as there is no messing around and you know that even the most gusty wind is not going to blow those doors open. Also adding a padlock to a pad bolt is very easy. The large window on the side does have some framing inside it so it is not like the items you have in here are really exposed. Also the window is on the side so again it would not be all that easy for a person walking past to have a cheeky look at your awesome tools. In all, we are very happy with the level of privacy that this shed offers. 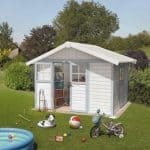 Like most other discount sheds there are not much in the way of customisation options here. Actually there are none at all, but that is not a bad thing as if there is a shed that is perfect the way it is, it is this one. You do have to treat it so using a coloured wood treatment may be one way you could change things a little. The only extra that is on offer with the 7 x 7 Shire Barn Double Door Shed is a professional installation service. Now as this is a barn we can only assume that it is an Amish installation service that will be offered, but that has not actually been confirmed. At £249.99 though, we do feel the installation service is a bit on the high priced side, so we suggest you just roll your sleeves up, call in brother Ezekiel and do it yourselves. This really is an incredible looking shed that has had no corners cut at all. 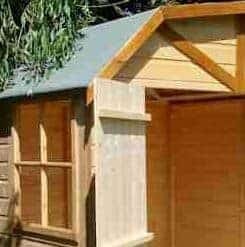 By far one of the best made under £500 sheds we have seen. You really do have one very robust shed on your hands here. It is designed to be very strong and long lasting. The only thing to remember is that as strong as it is, you are responsible for keeping it free from rot. We are very pleased with the storage space that this offers. It is an excellent shape and the generous height means that you can stack things up quite high as well to really make the most of the space it offers. With the help of a friend, a good toolbox, a cooler full of coke and plenty of snacks this is going to be a straightforward and dare we say fun experience. Just do what the instructions tell you, keep the swearing to a minimum, watch your thumb with the hammer and you will be fine. At just over £400 we are very impressed with the overall quality. We feel that the price they are asking for this is very fair and honestly have no complaints at all. Final Thoughts: We feel that the 7 x 7 Shire Barn Double Door Shed is one of the best looking discount sheds available. It is impossible not to be impressed by this and we are sure that you will notice many of your neighbours looking at it with envy. 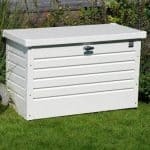 While looking great is one thing, this shed is made with top quality materials and has a design that will ensure you get many years of use out of it. We really cannot think of anything bad to say about this shed, that is how good a job they have done. 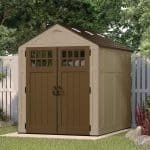 While it may be a wee bit more expensive that some of the other budget priced sheds we have looked at, sometimes you are better saving and spending a little bit more to get something that is extra special.